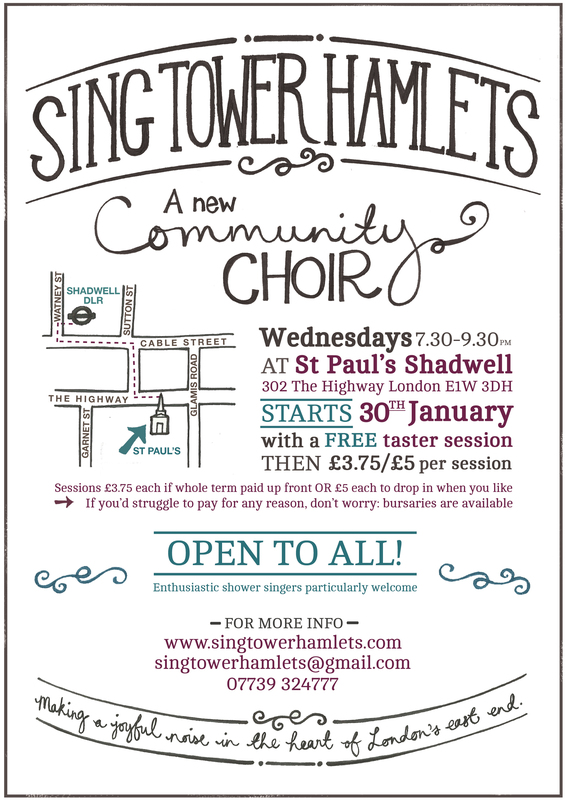 Hello and WELCOME to the Sing Tower Hamlets website! Singing and Tower Hamlets are two of my favourite things. Needless to say I’m REALLY EXCITED about launching Sing Tower Hamlets as a new community choir in this brilliant borough in a few weeks’ time! I have a website! (This is it! In real time!) I know, I know: it’s 2013, everyone and his dog has a website. But it’s my first… which I find exciting! And how to get in touch if you have any unanswered questions! The main purpose of the website is to provide information on the choir both for existing members (watch out for members-only content – ooh!) and for those thinking of visiting/joining. This blog on the other hand will be used not only to provide Sing Tower Hamlets updates, but also as a space for me to generally enthuse about all-things-singing/choirs, which if you know anything about me, you’ll know I love to do! Until then… I’m really looking forward to getting the choir off the ground, and I hope to see you on Weds 30th Jan for the taster session!